At the time of that first post I was using an iTelescope.Net demo account to try out the idea. I believe they’re the leader in this market, so I saw no reason to look elsewhere, but a more committed trial was required. I signed up for one of their Starter-Trial membership plan that provides access to all the telescopes and a minimal monthly allowance of imaging credits. If I needed more I could buy them, but for a monthly commitment I set my budget low. What I got in exchange was access to some incredibly high quality and expensive equipment. My personal favourite for wide field imaging – and I think everyone else’s – was Telescope T20 in New Mexico. For those that know anything about astrophotography this is a Takahashi 106 FSQ-ED sporting an SBIG STL-11000M camera with a full suite of filters all sitting on a Paramount PME. Exclusive though this hardware and software might be, it didn’t always work as expected. In fact of 19 imaging sessions I suffered 12 failures for reasons varying from unscheduled equipment maintenance, to guiding and positional errors. I also learned that the New Mexico and Australian climates in 2015 tended to the turbulent. Large and prolonged stormy weather fronts scrubbed many attempts too. Roof closed events (weather and maintenance) weren’t charged in the first place, and I have to say that the other errors were very promptly refunded. I’ve no service complaints other than once an imaging slot is lost it can be very hard to find a time to rebook and have another go! The popular telescopes are very booked up around New Moon. The lessons were that you can’t buy great weather, and that no matter how expensive the equipment pointing and guiding the telescope is not as reliable as you’d hope. It can take a very long time to collect your data, but collect data I did, so what did I get for my money? I found that a variable star photometry session cost me around £2.50 per observation, and I couldn’t help feeling that it turns out a bit expensive. It should be noted that it’s not possible to do spectroscopy with any of these services at the time of writing. That would be a nice addition to photometric study. Additionally these services aren’t all that keen on users that take lots of short exposures of multiple targets since they don’t charge for slewing and setup time. You use too much scope time for the amount of changeable imaging time, which is fair enough. I didn’t do much photometry and soon reverted to my exclusively visual variable star observing ways. 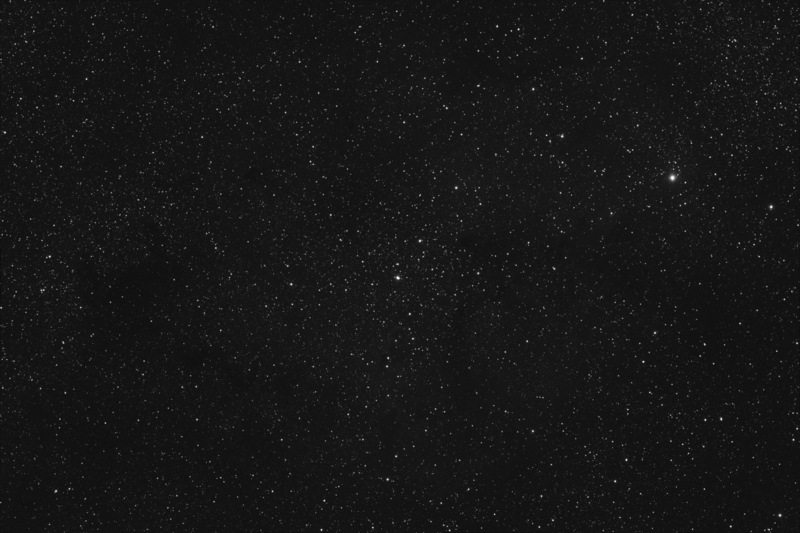 I can’t escape the feeling that wide field gets pretty cliche. There are lots of images of large bright nebulous objects on the internet, does the World really need any more? Still I – and I assume everyone else – needed to start somewhere… I decided on one of my favourite regions of the sky: IC1396 in Cepheus. Visually you have Trumpler 37 (open cluster) and double stars, especially STF2816 right in the middle. 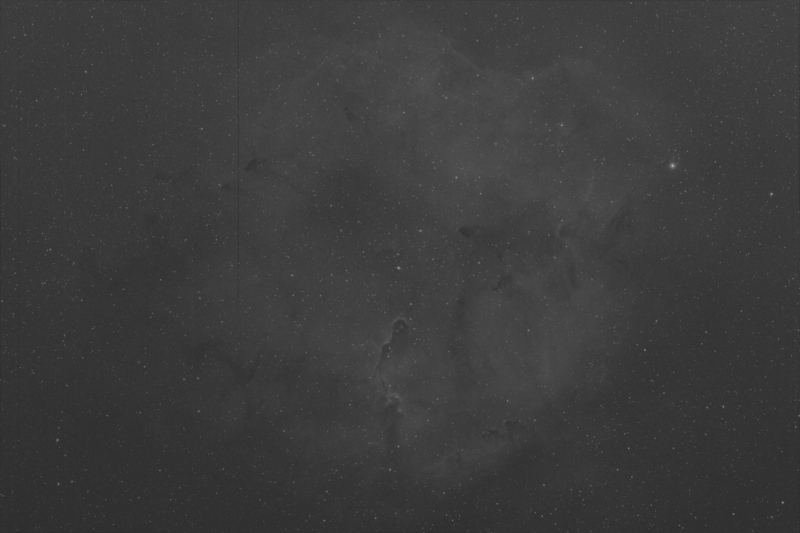 I’ve managed a hazy visual observation of the emission nebula too, which I was really pleased with, but I thought a camera and the New Mexico sky should bring those dark nebulae out to play. I hoped a conservative start with luminance alone would help gauge how bright this thing would be for a camera. I had no idea how long the exposure should be, but went long – 5 minutes each – in the hope of seeing some of the nebula. The guiding seems OK and I was surprised that the stars weren’t horribly overexposed. There’s a hint of the nebula and those dark clouds, but its not leaping out at me. So I decided to see if I could draw out them out with a hydrogen alpha filter. You’ll have to believe me when I say that there’s more of the nebulae in this frame. I could stretch it further, but it gets too light and noisy for my tastes. It really needs more sub-frames to enhance the view without excessive noise. IC1396 with T20 and Hydrogen Alpha filter as above, but really over-stretched! OK then, that’s the over-stretched version on which you can see an annoying vertical gradient and some dead columns of pixels – despite dithering and median stacking – you couldn’t see in the dim version above. 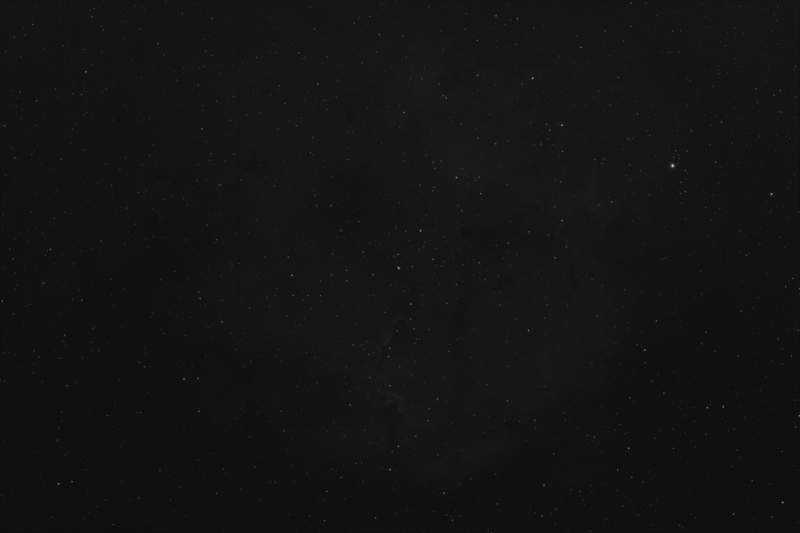 But the dark nebulae are really there! Now neither of these are going to make the great astrophotographers of the World quake in their boots. Bear in mind that these are very low resolution copies. But there’s 20 minutes of imaging in each and they’ve cost about £15 a piece already… that’s quite a lot of money. I’ve never experienced an image that’s as dynamic as the same object seen visually. True, the extent of what I can see is often limited, but for real detail there are many skilled amateurs – and pros – out there filling the need for wonderful images. A personal issue perhaps, but I collected data on quite a few other objects and I didn’t get a buzz out of any of those images either, and it’s not just because they’re not very good. It might be that I’m missing the pride of ownership from collected the data on my own equipment and doing the whole job. I understand the excitement of learning a new skill and can see how remote services remove at least half of the astrophotography hobby. The experience has made me think about my position on astrophotography. For me imaging is about examining impossibly faint structures, learning about chemical composition and generally doing what visual observing can’t. Perhaps there’s a marked difference between the goals of astro-imaging and astro-photography? I’ve been using these terms interchangeably, but maybe I shouldn’t? Though I’ve no complaints about the services of iTelescope.net, you can probably tell I’m not convinced that remote astrophotography is worth it. So I’ve used up my remaining credit and cancelled my account. My conclusion is that this activity is currently too expensive and limited in scope for my tastes.